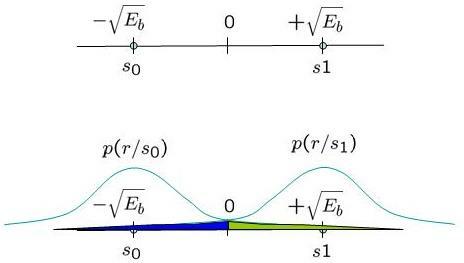 Following the request by Siti Naimah, this post discuss the bit error probability for coherent demodulation of binary Frequency Shift Keying (BFSK) along with a small Matlab code snippet. Using the definition provided in Sec 4.4.4 of [DIG-COMM-SKLAR] ), in binary Frequency shift keying (BFSK), the bits 0′s and 1′s are represented by signals and having frequencies and respectively, i.e. is an arbitrary phase (assume to be zero). The two frequencies and are orthogonal, i.e. 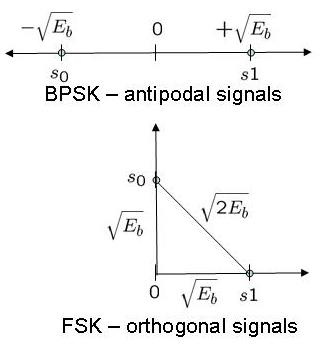 Simple transmit-receive block diagram for binary frequency shift keying (FSK) can be as shown below. 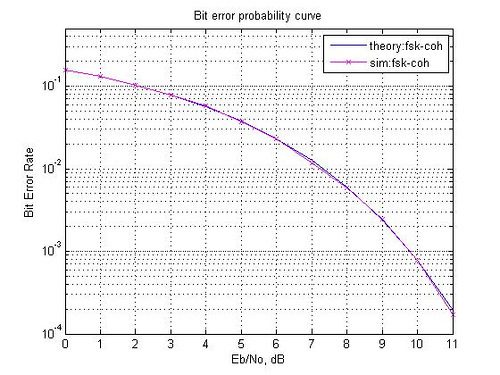 For obtaining the same bit error rate as BPSK, binary frequency shift keying requires around 3dB more . More details on the bit error curves with orthogonal and antipodal signals is discussed in Sec 3.2.5 of [DIG-COMM-SKLAR] . (e) Counting the number of errors. what kind of method did you use to find the bit error rate? how does it vary if I am supposed find out BER by using monte-carlo iterations? I am trying to code 16-FSK modulator and then compute average energy.How can I do this? Your help will be appreciated. @Siddharth: Define your signal vector and find the mean square power. k=log2M and for mfsk please help me. i want some information about it. @zardosht: Hmm… the k = log2(M) means, if we have M constellation points we can send k = log2(M) bits in a constellation symbol. For eg, with 16QAM we can send 4 bits together. I recently found this website. Great Effort. .
Can someone help me out on this please. I am looking for MAT LAB PROGRAM TO IMPLEMENT HUFFMAN CODING. @Chandrakanth: Sorry, I have not discussed Huffman coding till date. Can someone help me out on this please. I need the matlab code. @Srinivas: I have not done MLSE equalization in multipath channel, but plan to do that in near future. i want to plot the BER vs Eb/No of fsk coherent and noncoherent on awgn and raleigh channels. @RAO: Sorry, I have not tried modeling FSK with non-coherent demodulation OR in Rayleigh channel. What will BER be for M-FSK, if M=4? @Joe: Am not sure about the precise answer, however a quick googling threw up the following link. Your simulation is very useful for me. Krishna, I want to ask about continuous fsk. Is continuous phase FSK same with fsk? 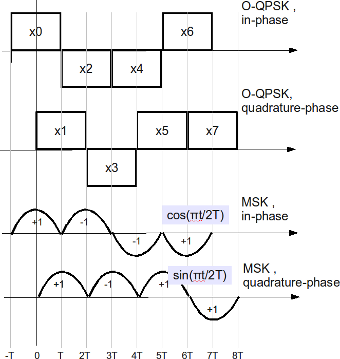 How we define continuous phase in fsk? Can we use MSK to modulate 4-ary or 8-ary? Because I think MSK is just to modulate binary. What do you think about that? @kalfika: Well, am also not aware of MSK systems using 4-ary/8-ary. Quick googling did not fetch me much results. @davis: Well, given that we need to send both 1Hz and 2Hz, I do not think that the data bandwidth becomes equal to the carrier separation. Given the above understanding, am unable to understand your perspective. Can you please provide more details.